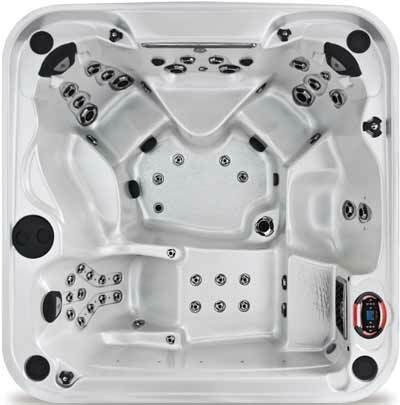 The Radiance Lounger has curves in all the right places and boasts the most unique water feature in the industry. This deep, raised back edge spa offers protection from the elements and privacy from the neighbors. 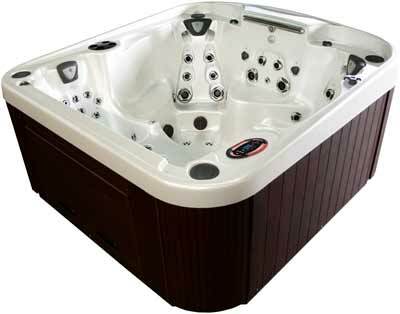 It features 8' our exclusive Ultra Lounger where you can stretch out and let your cares melt away, or sit in one of the two deep buckets seats that offer a different variety of jet package that give a unique and deep massage. The cool down seat under the exclusive 24" waterfall may be the best seat in the house as the water gently cascades down your back and neck. The Radiance Lounger redefines your spa experience. Dimensions: 92.5" x 92" x 40.25"